The H-Bridge is designed to drive a motor clockwise and anticlockwise. To reverse a motor, the supply must be reversed and this is what the H-Bridge does. An H-Bridge can be made with SWITCHES, RELAYS, TRANSISTORS or MOSFETS. Note: Some circuits are just demonstration circuits and need "damper diodes" (protection diodes) to reduce spikes. Do not make circuit "A." It can easily create a SHORT-CIRCUIT. It is only a demonstration circuit. Switch A and D will make the motor rotate clockwise. Switch B and C will make the motor rotate anti-clockwise. Switch A and B will create a BRAKE. Do not close switch A and C at the same time. Do not close switch B and D at the same time. The motor is active at all times. Push the button to reverse the direction of rotation. This circuit has an advantage. It has FORWARD, OFF, REVERSE and BRAKE (off is BRAKE). The relays are single-pole change-over. The first two circuits above are manual. For a project such as a robot or car, we need an ELECTRONIC circuit - one that is controlled by a "CONTROL CIRCUIT". The Control Circuit outputs a signal (or a number of signals) to control an H-Bridge. Here is a circuit of a Hex Bug. The Control Circuit consists of the first 3 transistors. These amplify the signal from the electret microphone and produce a signal that is able to charge a 47u electrolytic. The next two transistors provide inverted signals to the H-Bridge and are part of the Control Circuit. The H-Bridge consists of the last 4 transistors. 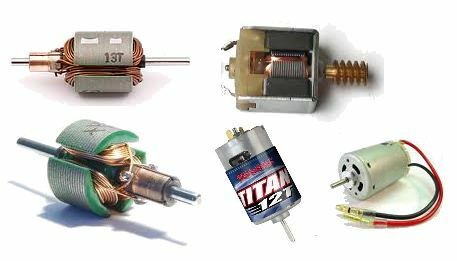 These motors come in different shapes and sizes and have an output from 2,000RPM to more than 16,000RPM. They operate on less than 1v to more than 24v and the current they require can be less than 100mA to more than 5 amps. 1. They all have a permanent magnet called the FIELD MAGNET. 2. They all rotate in the opposite direction when the supply is reversed. 3. They all take a high current when starting and a lower current when rotating (spinning) at maximum RPM (Revolutions Per Second). 4. They all take a higher current when loaded - (the motor is driving a load). A load may be placing your fingers on the output shaft or driving through a gearbox and lifting a load or driving wheels via a gearbox. The torque (twisting ability of the output shaft) depends on the voltage and current as well as the strength of the field magnet and the quality of construction (the closeness of the field magnet to the armature). To drive a motor forward and reverse, the circuit must deliver a voltage in one direction, then in the opposite direction. It must also be able to deliver a "running current" (operating current) (say up to 1 amp) and a "starting current" (up to 5 amps), and a "loaded current" (up to 5 amps). The transistors must be capable of passing a "stalled current" without being destroyed. The power supply must be capable of delivering a high current so the motor will START-UP under load. The circuits we will discuss are called a transistor H-BRIDGE. The active sections of the circuit create the letter "H" to produce the term "H-Bridge." There are a number of different H-Bridge designs and the actual circuit will depend on the number of transistors, the type of layout, the number of control lines, the voltage of the bridge, and a number of other factors. That's why we have a number of different designs to cover these variations. This design uses 4 transistors. Both inputs must NEVER be HIGH (this will create a short-circuit and damage the transistors). However this circuit is a good design. The voltage on the H-Bridge can be any voltage and the control voltage just needs to be higher than 1v. The circuit provides OFF feature when both inputs are LOW but does not provide BRAKE feature. This design uses 6 transistors to do the same job as the circuit above. It does not have any advantages over the circuit above and simply uses extra components. The input voltage must be more than 1.5v for A and B must be higher than 4v to turn off line B. When line B is less than 3.5v, it activates the circuit. The timing of the inputs will prevent any "shoot through" current. When the output of the gate is low, the bottom transistor is not turned on but the top transistor is fully turned ON. When the output of the inverter rises, the top transistor is ON and the lower transistor is also turned on. When the inverter is HIGH, the top transistor is turned OFF. During the time when the inverter is changing from LOW to HIGH, both transistors are turned ON. The HIGH on the motor will be rail voltage minus the collector-emitter voltage (about 0.3v). The total voltage-drop to the motor will be about 0.6v. This circuit does not have the "shoot through" current during the time when the inverters change state but it does not have the same performance as the circuit above. The voltage on the IC and H-Bridge must be the same. The transistors are EMITTER FOLLOWERS and the voltage on the motor will be less than the voltages on the circuit above because the HIGH on the motor will be determined by the output voltage of the IC, minus the slight drop across the 1k and the voltage drop across the base-emitter junction of the transistor (a total of about 1v). The total voltage drop to the motor (due to both sides of the bridge) will be about 2v. The circuit is only suitable for a low-current motor as the 74C14 can only supply 10mA and the 1k base resistors will limit the current available through the transistors. The resistors can be reduced to 470R. This circuit requires 4 inputs and the HIGH inputs must be about 12v. The LOW inputs need to be as close to 0v as possible. With correct timing of the inputs, no "shoot-through" current will be produced. This circuit controls the speed of a 12v drill and drives a MOSFET. The H-Bridge is a reversing switch (double-pole double-throw). The MOSFET will deliver up to 30Amps. The frequency of the oscillator is in the range 550Hz to about 6.5kHz, with an off period of about 2.6us. This circuit uses 2 555 IC's to provide forward and reverse motor-control. It does not have an "OFF" position. When pins 2&6 are tied together, the 555 becomes a Schmitt Trigger, detecting when the input is above 2/3 of rail voltage and below 1/3 rail voltage. The only problem with a 555 is the output voltage on pin 3. It does not rise to rail voltage and does not fall to 0v. The HIGH can be about 1.5v less than rail voltage and the LOW can be 0.7v above the 0v rail. The actual HIGH and LOW from the chip will depend on the supply voltage and the current taken by the load. This circuit produces speed control in forward and reverse direction. It does not have an "OFF" position. This circuit uses buffer transistors on the output to deliver up to 4 amps to the motor. It does not have an "OFF" position. As mentioned above, the output from a 555 (pin 3) is less than rail voltage and since the BD679 transistors are "emitter followers" they will have at least 2v5 drop across the collector-emitter terminals and thus need heatsinking. The motor will not see more than 8v5. [This is not a very efficient H-Bridge.] The most efficient H-Bridge use transistors in an arrangement shown in Design 1-6 and 15. These arrangements have the lowest voltage-drop across each of the transistors. This means the maximum voltage will be delivered to the motor and thus the motor will produce the maximum torque (power) and will take the maximum current when fully loaded. Even a slight voltage drop to a motor will be noticeable when the motor is under load, so it is important to have a power supply that is capable of delivering a high current and a 'low-loss" H-Bridge. This is a half-bridge circuit. It is low-cost and effective. It requires a "split-supply." This is a 6v battery tapped at 3v or two 3v batteries. The input voltage needs to be about 1v. Both inputs must NOT be HIGH at the same time. The circuit has: Forward, OFF, Reverse. This circuit uses a half-bridge to dive a motor in the forward/reverse direction. It does not have an "OFF" position. This circuit needs just one input-line from a microcontroller to produce forward/reverse. It does not have "OFF" position. The input must be 0v for forward and 5v for reverse. When we say 0v on "A" we do not mean simply removing the 5v but taking "A" directly to the 0v rail - in other words, "shorting A to 0v." This is done via an output from a previous stage called a DIGITAL STAGE that produces 5v when HIGH and 0v when LOW. This circuit uses 4 x BD679 Darlington transistors to drive a motor: Forward - Off - Reverse. Two inputs are needed and both must NOT be HIGH at the same time. It does not have a BRAKE function. This circuit is a SOLAR TRACKER. It uses green LEDs to detect the sun and an H-Bridge to drive the motor. A green LED produces nearly 1v but only a fraction of a milliamp when sunlight is detected by the crystal inside the LED and this creates an imbalance in the circuit to drive the motor either clockwise or anticlockwise. The circuit will deliver about 300mA to the motor. The circuit was designed by RedRok and kits for the Solar Tracker are available from: http://www.redrok.com/electron.htm#tracker This design is called: LED5S5V Simplified LED low power tracker. To select the type of H-Bridge for your particular application, you need to match the H-Bridge inputs with the outputs from your circuit. Some H-Bridges need 1v to activate each leg of the bridge and others need slightly less than rail voltage to activate. In other words, they are active-LOW, but the voltage will need to rise to say 12v to turn the line off. Some of these requirements are very difficult to achieve, so you should pick a simple design. Some H-Bridge circuits are over-designed - such as using an LM311 comparator to drive each side of the bridge. This can be replaced with a BC547 transistor on each side of the bridge. In addition, some bridges drop (lose) 1v or more on each leg and this will reduce the power of the motor considerably. The answer is to supply the bridge with a higher voltage. You can supply a motor with a slightly higher voltage and get the maximum performance from the motor. The motor will run much faster on no-load, but you will get the power you need when it is loaded. The circuit uses N channel IRF3708 MOSFETS in the low side and P channel SPP18P06P in the high side. The pair of BLUE LEDs generate a differential voltage applied to the gates. The diodes cause these voltages to always be above ground. If one side is higher than the other, one IRF3708 MOSFET turns on harder and and enables the SPP18P06P MOSFET on the opposite corner to also turn on causing the motor to turn. If the differential voltage is the other way the motor reverses. This circuit requires a small bias current be pulled out of the MOSFET gates to compensate for the leakage currents going into the gate from the positive supply which would could cause both MOSFETs to turn on; a bad thing. A pair of resistors could be connect from the gates to the emitters to absorb the approximately 20nA of leakage current. Or you can use diodes that have more leakage current than the MOSFET gates. The 1N4148 universal high speed switching diode has about 20nA of leakage current; more as the temperature goes up. The reason normal 10MΩ resistors don't work is they consume more current than can be supplied by the BLUE LEDs. Low leakage diodes such as the BAS416 don't work in this circuit is because their leakage current is too low. The following circuit pulses a latching relay every 30 seconds. The circuit only consumes current during the 50mS latching period. The values for the timing components have not been provided. These can be worked out by experimentation. H-Bridge. Forward and reverse signals must not be applied at the same time as this will create a SHORT-CIRCUIT. 1N4148 diodes will not be suitable. Use 1N4004 diodes. This circuit will operate from a 5v microcontroller and provide forward/reverse/brake. Use TIP31/32 and BC547 transistors. The input transistors work in an unusual way. They are emitter-followers but they have the load in both the collector and emitter circuits. This circuit does work however the transistors in the bridge will not provide a high current. The current-capability of the bridge comes from the ability of the transistor to amplify the current entering their base. Let us consider Q3. The current entering the base of Q3 via the 1k resistor will only the about 1mA and this means the collector-emitter current will be a maximum of 300mA. The current-capability of Q6 will be higher. When Q2 is turned on via the 10k on the base, we will assume the control voltage is 5v and 0.5mA will enter the base of Q2. This will allow 100mA to flow through the collector-emitter terminals of Q2 and this will be adequate to completely turn ON Q6. The current capability of Q6 is 500mA. You can see the limitation of the circuit is Q3 and a motor will draw 300mA or more when under load. To make the circuit more reliable, POWER TRANSISTORS are needed in the bridge. This circuit looks very good until you realise the transistors are DARLINGTON and they produce about 2v to 2.5v across the collector-emitter terminals. This means you can lose up to 5v for a 12v supply and the motor will have almost no strength. In fact the supply can be 1v higher than the motor-voltage to allow for the losses in the bridge and this will give the motor full strength. You can even increase the supply by up to 3v to 5v to produce enormous torque when needed and use PWM to control the speed of the motor (RPM - and thus torque) for all other situations. For this circuit you can increase the supply by 5v and then add another 3v to 5v to achieve the maximum from the motor. The use of four opto-couplers allows a microcontroller to control the bridge as all the control lines are completely isolated from the bridge. This circuit takes into account the maximum gate voltage of about 12v for the MOSFETS used in this design. The two 4k7 are voltage dividers and the resistors turn OFF the P-Channel MOSFETs when the transistors are not activated. The input voltage can be as low as 2v but the circuit is designed for 5v input from a PIC microcontroller. That's why you need the transistors, because the 5v micro will not go high enough to turn off the P-ch MOSFETs. The advantage of a MOSFET is obvious when you understand the voltage across the collector-emitter junction is about 0.5v to 0.7v and even 0.9v when the transistor is allowing a fairly high current to pass. This means you lose about 1.4v to 1.8v in a bridge-arrangement. MOSFETS have a turn-on resistance between DRAIN and SOURCE (or SOURCE and DRAIN) of about 100 milliohms and this means a voltage drop of only 0.1v when 1 or 2 amp is flowing. This produces a loss of only about 200millivolts but the important fact is the heat in each MOSFET will only be about 100milliwatts and the device can be quite small and not require a heatsink. In many cases you will require and input voltage or more than 2v and maybe up to 5v to fully turn on the MOSFET and for this you will need a digital output from a microcontroller. You must make sure the top and bottom FET in a totem-pole does not turn ON at the same time and this will create a short-circuit across the supply. The program needs to have a long time-delay between the motor going clockwise and then going anticlockwise, because the motor will seem like an absolute SHORT-CIRCUIT when it changes direction. To get a motor to start under load requires at least three times the running current. In addition, a motor take 3 times the running current when it is loaded. That's why an H-Bridge must be able to deliver a HIGH CURRENT. To deliver a high current, the transistors must be fully SWITCHED ON. In other words they must be fully SATURATED. To fully saturate a transistor, the base current must be about 1/10 the collector-emitter current. Most transistors have a gain of about 100 but this only applies when the transistor is passing about 10mA. To get a transistor to pass a high current, the base current must be increased to about 10mA for every 100mA collector-emitter current. Transistors are not linear devices and that's why this requirement is rarely mentioned. Most specification-sheets highlight the qualities of a transistor and fail to mention the problems you will encounter. That's why you have to drive the output transistors in an H-bridge via a DRIVER TRANSISTOR. The driver transistor will have a gain of about 50 so the input current to the bridge will only be a few milliamps. The other factor you have to take into consideration is the VOLTAGE-DROPS across each leg of the bridge. You need to build a test-circuit and measure the voltage drops on each leg before committing to a particular design. The performance of a motor will fall considerably if it does not see full rated voltage. You can increase the supply voltage to a bridge to account for the voltage-drop across each leg. This will increase the no-load RPM but allow the motor to produce maximum torque. If you are using MOSFETs, the gate must be at least 0.6v higher than the Source. This is the case with an IRF3708 as it has a very low turn-on for the gate. However many MOSFETS need about 3v before they will start to turn on. There are many H-Bridge circuits on the web that do not work, so you have to be careful. See our Spot The Mistake Page 11 for H-Bridge circuits that do not work. Other circuits are over-designed, so compare your needs with the circuits above.